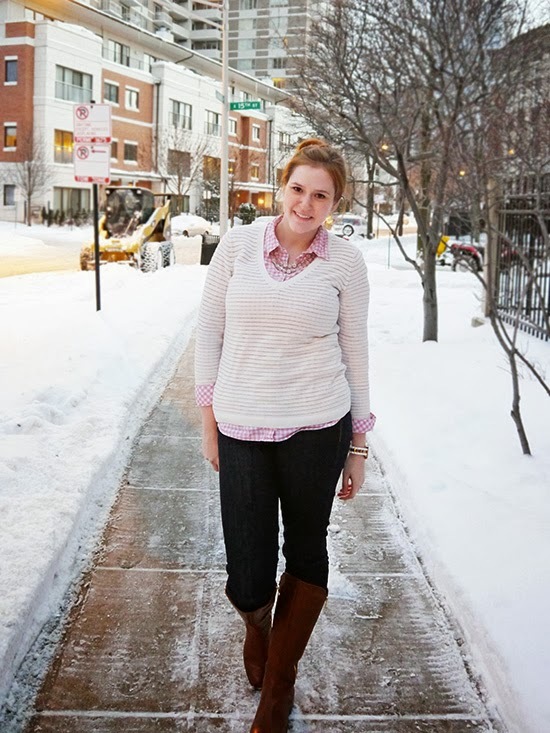 Kristina does the Internets: In February, we wear pink. In February, we wear pink. Every year as soon as February rolls around, I start wearing pink. I'm not sure if it's because of all of the Valentine's Day stuff floating around, or just because I get really sick of winter and start wearing pastels in hopes that spring will come soon. Either way, a little pink always makes me happy. Oh, and yes, that's a little scoop truck behind me in the first picture. For some reason when it snows in my neighborhood, they bring in little trucks to pick up the snow piles and put them into a dump truck and drive it away. Does that happen in other places? I've never seen it anywhere else. You can also see where I wore this gingham shirt here and here. I'm actually wearing a pink sweater today, too! I should have saved it for V-day, but oh well! 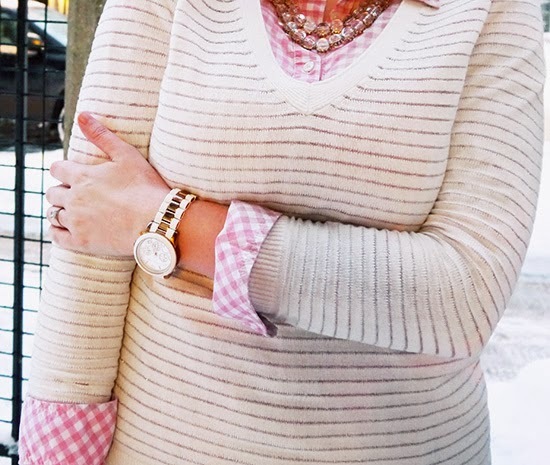 Love this shade of pink and the pattern mixing! Hi Kristina! I am visiting from the Trend Spin Linkup! I love love love your look! PS- great post and blog titles as well. I can't wait to follow for more! Yes for pink! February puts pink on my brain too. Love the subtle pattern mixing going on! That MK watch is so cool, too bad it's not for sale anywhere! Love the layers, very cute look! I really don't own much pink, but I'm going to have to break out a shirt for friday. You look so cute! Hooray for pastels! I'm always so conflicted at this time of year because I want the damn cold to be over, but I love layering so much and know that warmer weather means less opportunity for that. Although, after this year, warm weather still cannot come soon enough. Also, how creepy is it that I have now figured out you probably live in the south loop area based on the street sign? Hahaha you are the second person this week to have pinpointed where I live. Maaaaaaybe I should stop taking pictures in front of street signs? Yeah I know :( I've looked for it a couple times to link but it seems to be gone everywhere.